In 2015, the Ad Builder tool was developed as a beta product by Yieldmo. It was designed with the sole purpose of allowing our internal teams to quickly create ad format samples to show existing and potential clients how their assets and materials would look when published. Over time, our internal stakeholders (campaign managers, account directors and co-ordinators) began using Ad Builder for new purposes. For example, they found it was easier to prepare advertiser’s creative for publishing by using the tool, compared to using to our internal Admin product’s publishing tools. 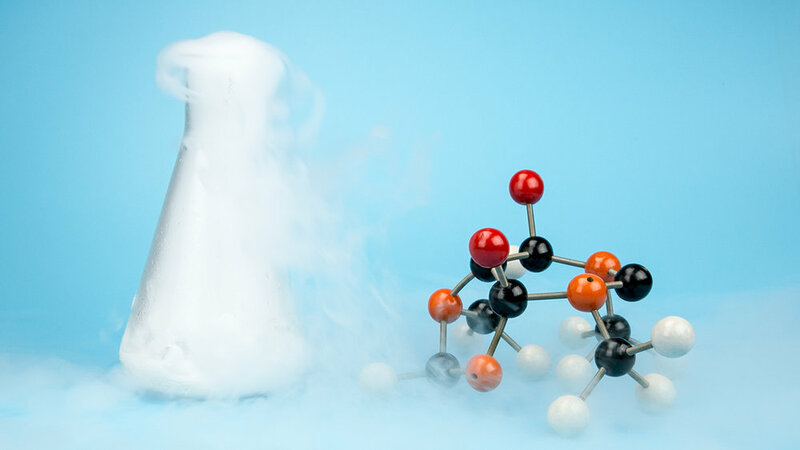 As with any beta product, it quickly became outdated, and didn’t meet the needs of the teams that were using it for new purposes. It caused technical issues when used to prepare and push creatives to Ad servers, it had very poor usability and user experience, and forced our internal users to find numerous workarounds to do their job. 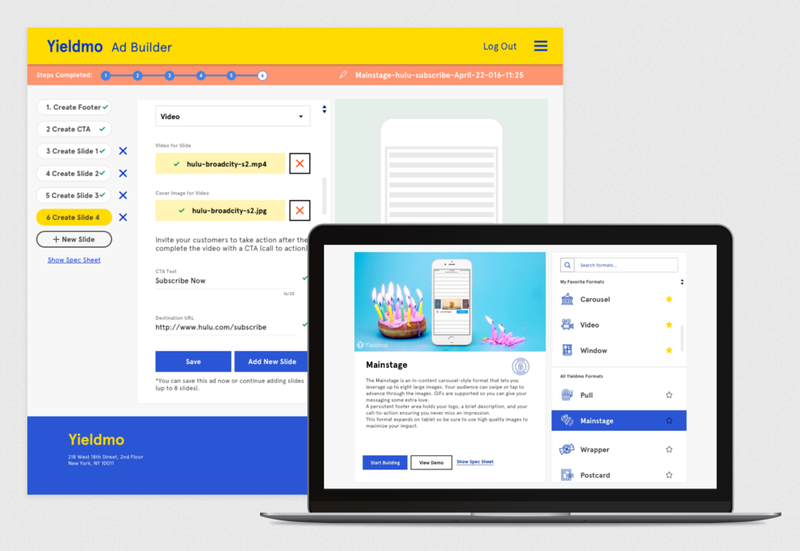 We decided to do a complete overhaul the Ad Builder product to address these problems. Yieldmo’s newer ad formats that didn’t exist when Ad Builder 1.0 was developed. Outdated UI that didn't follow Yieldmo’s Design System. Outdated user experience and no navigational hierarchy. Poor product feedback to users (error messages, tasks complete etc). No current specs, directions and required assets to create ad formats. New UI components that were required to be designed with newer ad formats in the build phase of the ad formats. Guests who did not have credentials (non-authenticated users) could see formats but also experiment and create ad formats. Leverage our new Design System. Design steps and user flows for new ad formats. Design a spec sheet to show users the required assets and instructional notes for using each ad format. Support a new login experience with new production workflows and infrastructure, so that only authorized users can create content using the tool. Create a new navigational experience throughout creation of the ad formats. Navigation between each displayed ad formats . We had our own assumptions and objectives that we wanted to build for in version 2.0, based on all the stakeholders that we talked to. 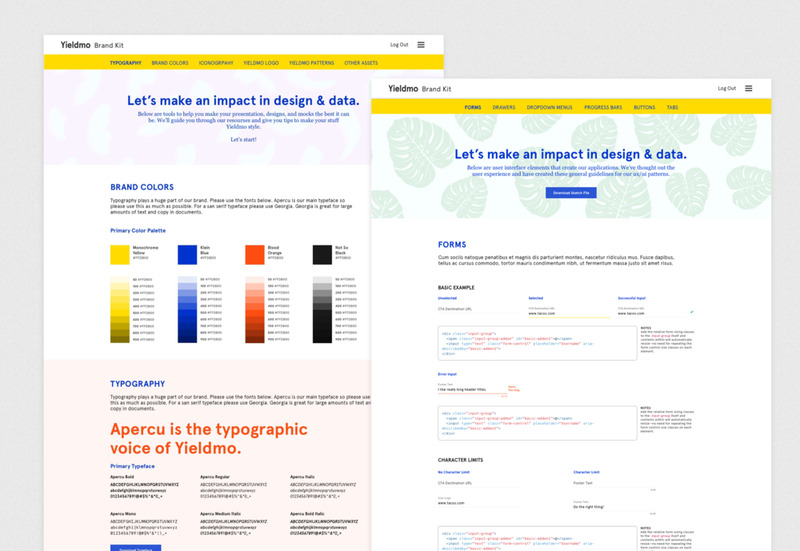 At the time, we had a new Design System in progress, and several ad formats that were being designed and tested. 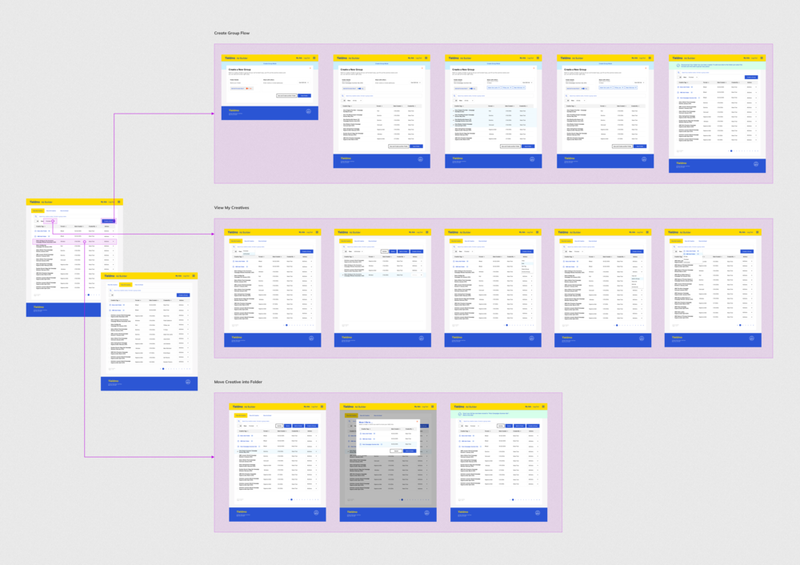 Since there were so many dependencies and moving pieces involved with the product, we dove straight into creating wireframes and user flows to address some of the known pain points our teams had with version 1.0 of Ad Builder. There were a handful of new ad formats that were not supported in 1.0 and we had a extensive group of external users (publishers and advertisers) were actively using the tool to create ads already without access to the new formats. We had to be careful and make sure that everyone who was using the tool would supported by the new version. 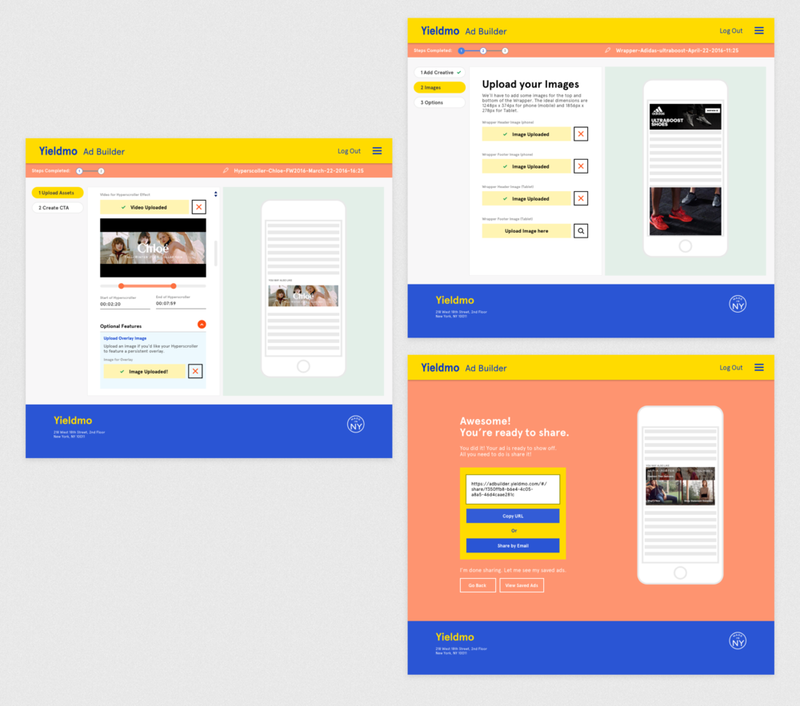 We set out to build new user flows for the newer ad formats, address the usability issues, and update the user interface to align with the new Design System. Throughout the entire process, I paired with the lead developer to create these new workflows and updated screens. After the first round of designs and prototypes, we started to conduct usability tests on the new improved version. We tested our prototype on all our internal stakeholders, as well as some of our publishers and advertisers. 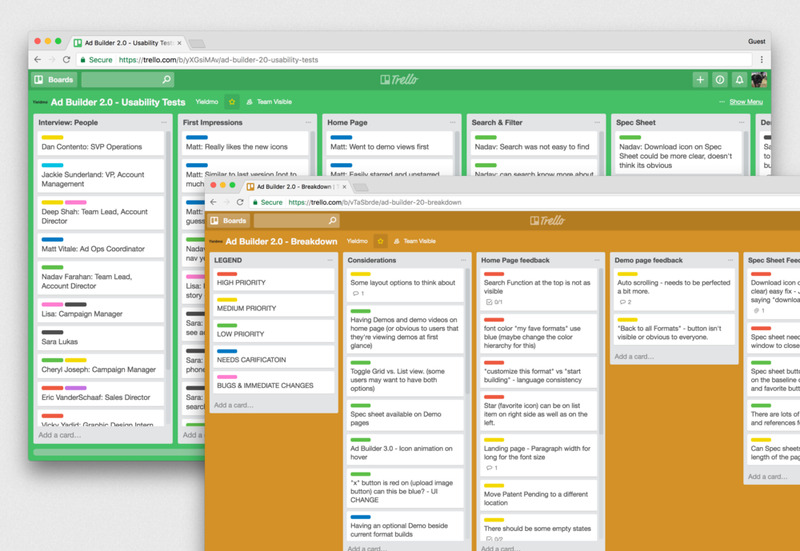 We used Trello to track feedback and for user research synthesis. After all of the sessions, we organized the feedback and identified common themes so we could prioritize our next set of tasks. We iterated and updated the designs and did final usability tests for validation and set out to launch the product with minor tech updates to follow. Ad Builder was being used for more than four different purposes that were drastically different from one another. Users found ways to workaround the tool achieve other outcomes. Users were asking for other features that were not related to the Ad Builder, but wanted them within the same application or workflow.